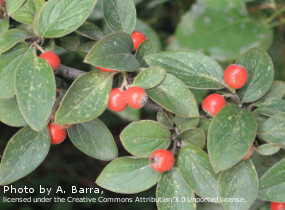 COTONEASTER FRANCHETII. Hedging Plants, Trees, Shrubs and Conifers. Fast growing, dense, evergreen hedge with small ovate foliage, grey-green above and white beneath. Clusters of pink and white flowers loved by bees in June followed by persistent egg-shaped orange-red berries in autumn. The berries make good food for wildlife. HEDGE Trim back vigorous shoots after flowering and trim to shape in February. For hedges 6-7ft (1.8-2.1m). Plant 2-3ft (60-90cm) apart. SHRUB 8ft x 5-6ft (2.4m x 1.5-1.8m). Makes a good specimen shrub which will be loved by pollinators in spring and hungry wildlife in winter.